Club Penguin Cheats by Mimo777 Club Penguin Cheats by Mimo777: Protobot Sends Message About Herbert! Oops! 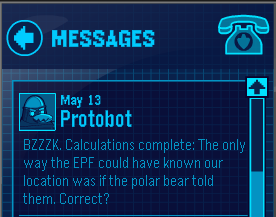 Protobot has figured our Herbert is helping us! What do you think it will do now? I don't think that any of you have noticed that Protobot is back online. Someone restarted him. mimo,club penguin put new levels for rollerscape on the beta team! Mimo I want to show you some NEW Australian CP merchadise I got the other day how can I contact you? Save the Polar Bear! If he does any damage... FIXING PARTY!! !